"Every girl who has read it says, ‘That was me in high school, or that was me in 7th grade. It reminded all of us of our own sort of awkwardness, or family dysfunction. It’s not the typical story where the ugly duckling is in love with the hot guy. They’re both trying to find their way. They’re both outcasts. 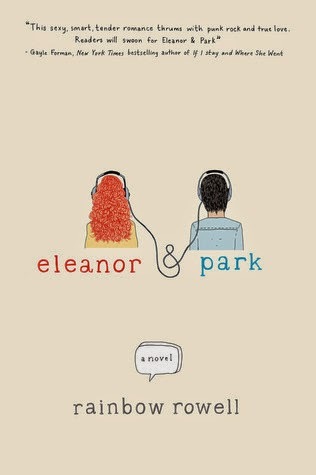 Aware of the problems of adapting eleanor & park's alternating point of view, Bario has signed on the novel's author to write the script. You can follow Rowell on twitter, where she's fielding a barrage of congrats, and a lot of relief from readers that the author is on board. I appreciate this on a couple of levels; my feminista side feels warm and fuzzy that Rainbow - a female - will bump up the numbers in the 'women in film' column and also because a novelist knows her novel's characters best. But there is that tricky little fact that scripts are not easy to write, that the novelist' skills aren't necessarily the same as the script writers, and as Rowell herself reminds us, it's not as though Rowell actually knows what she's doing when it comes to writing scripts! Having worked briefly for a top Hollywood producer, I've seen the thousands of scripts that come across the desk that just don't cut it. I will never understand the notion that a novelist can suddenly become a script writer; it's a little like asking a heart surgeon to do brain surgery. Yes, they both have the same medical background but when it comes to surgery, don't you want a specialist? A recent tweet from Rowell shows she agrees; I appreciate the mix of modesty and humor. … But I feel compelled to remind you I’ve never done this before. I hope you demand more experience from your surgeons and mechanics.